From the outset, folks suspected the self-shredding Banksy painting was a planned media stunt. 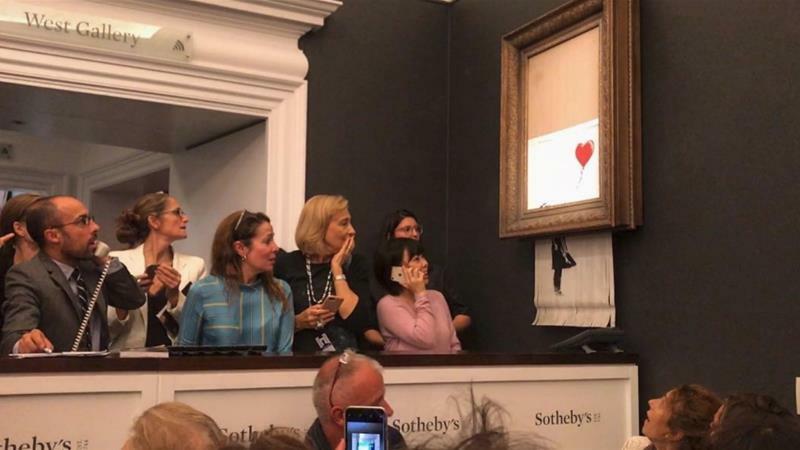 After all, Sothebys hung it on the wall instead of the customary easel, allowing the shredder to function, and put it up at the end of the day, so the fuss didn't interrupt other auctions. But the devil is in the details. At Artnome, Jason Bailey sets about myth-busting the shred, right down to the technical challenges of creating such a device. If you thought batteries couldn't last long enough to do the deed, you lose! But if you realized that a row of flatside-up exacto blades aren't going to start clean cuts, pat yourself on the back. Had Sotheby’s actually been completely caught off guard by a man with a remote detonation device and large frame concealing electronics making a beeping noise, one would assume they would have jumped into action assuming the worst. Instead, the porters calmly shepherded the work out of the room and returned to the activities of the evening. I assume Sotheby’s was familiar with the person who had the triggering device (if not also familiar with the specifics of the plan). Otherwise, one would hope the culprit would currently be in police custody for questioning. Sothebys will have to come clean about its involvement, or people will figure it has no security and can't be trusted with valuable artwork. But what then for Banksy? UPDATE: Here's another analysis, similarly suspicious of the xacto-shredding mechanism but still admiring the general excellence of the stunt.